I am a self-proclaimed foodie. If you know me at all, you probably know that some of my favorite websites are food blogs. I think about food awake or sleeping and I love to make food for family and friends. Therefore, I have to write a post about the lovely cuisine that sustained me during the time in Berlin. Obviously. Let's start with a German favorite, according to top 10 lists and Frommer's: currywurst. You take a weiner (said it), heap curry powder on top, put some tasty ketchup/barbecue sauce on top, add some fries or potato salad on the side, and serve it up. Yum, y'all. Berlin also has a sizeable population of Turks, many of whom live in the Kreuzberg neighborhood. I took a trip there to eat some Turkish food. 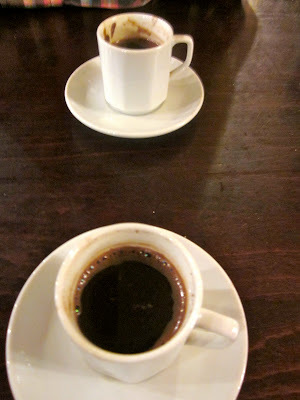 I split an order of hummus and kebabs with a friend, and drank an Efes beer and Turkish coffee. The lamb kebabs were gone too quickly to picture, but the others were successfully captured. My roommate, Tom, once heard that if you finish your coffee and flip the cup over onto a platter, you can read your future in the grounds. We all downed the chalky, thick black espresso-mocha-coffee-drink that smelled like dirt, then proceeded to flip cup. A couple of minutes went by before we checked for results... the sludge on the bottom of the cups was so thick it had not even moved. I choose to interpret this to mean that my future is so solid, so undeniably successful, that nothing can change its course of success. Beer may be a mainstay of life in Europe, but the biergarten is a mainstay of life in Germany. While I did try my fair share of beers in order to get a proper and literal taste of the culture, a favorite is the tasty Weihenstephan. Then again, it also could have been the atmosphere I drank this particular beer in. Word the wise: if ever in Berlin, be sure and make it to Prater Garten, Berlin's oldest biergarten. Though we had fabulous weather, it was too cold at night to sit outside, but the inside is hyggeligt (cross culture! Danish word for cozy/comfy) and I'm sure it is wonderful in the summer. Berlin: fattens you up, but God it's good.